This Princess diamond is 0.5 carat in weight, and comes with Very Good polish and Good symmetry, as verified from an independent gemological laboratory. 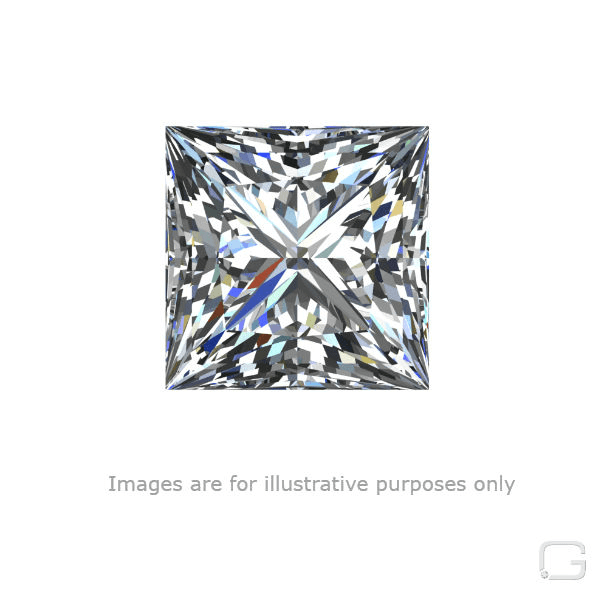 The diamond is graded G in colour, and has a clarity grade of VVS1. The diamond's GIA grading report number is 2314722854, which will detail further its specifications and measurements, and will also come with the purchase of the stone. AUD 11,935 Excl. Duties / Taxes. This Princess diamond is 1.08 carat in weight, and comes with Very Good polish and Very Good symmetry, as verified from an independent gemological laboratory. The diamond is graded E in colour, and has a clarity grade of VVS1. The diamond's GIA grading report number is 2165886957, which will detail further its specifications and measurements, and will also come with the purchase of the stone. AUD 8,997 Excl. Duties / Taxes. This Princess diamond is 1.09 carat in weight, and comes with Excellent polish and Very Good symmetry, as verified from an independent gemological laboratory. The diamond is graded G in colour, and has a clarity grade of VVS1. The diamond's GIA grading report number is 2151366220, which will detail further its specifications and measurements, and will also come with the purchase of the stone. AUD 16,958 Excl. Duties / Taxes. This Princess diamond is 1.56 carat in weight, and comes with Good polish and Good symmetry, as verified from an independent gemological laboratory. The diamond is graded G in colour, and has a clarity grade of VVS1. The diamond's GIA grading report number is 2175470254, which will detail further its specifications and measurements, and will also come with the purchase of the stone. AUD 2,539 Excl. Duties / Taxes. This Princess diamond is 0.59 carat in weight, and comes with Very Good polish and Very Good symmetry, as verified from an independent gemological laboratory. The diamond is graded G in colour, and has a clarity grade of VVS1. The diamond's GIA grading report number is 1119196915, which will detail further its specifications and measurements, and will also come with the purchase of the stone. AUD 1,228 Excl. Duties / Taxes. This Princess diamond is 0.31 carat in weight, and comes with Excellent polish and Very Good symmetry, as verified from an independent gemological laboratory. The diamond is graded E in colour, and has a clarity grade of VVS1. The diamond's GIA grading report number is 2161280543, which will detail further its specifications and measurements, and will also come with the purchase of the stone. AUD 38,254 Excl. Duties / Taxes. This Princess diamond is 2.13 carat in weight, and comes with Excellent polish and Excellent symmetry, as verified from an independent gemological laboratory. The diamond is graded E in colour, and has a clarity grade of VVS1. The diamond's GIA grading report number is 1313028454, which will detail further its specifications and measurements, and will also come with the purchase of the stone. AUD 2,274 Excl. Duties / Taxes. This Princess diamond is 0.6 carat in weight, and comes with Excellent polish and Very Good symmetry, as verified from an independent gemological laboratory. The diamond is graded H in colour, and has a clarity grade of VVS1. The diamond's GIA grading report number is 1206189471, which will detail further its specifications and measurements, and will also come with the purchase of the stone. AUD 3,822 Excl. Duties / Taxes. This Princess diamond is 0.76 carat in weight, and comes with Excellent polish and Excellent symmetry, as verified from an independent gemological laboratory. The diamond is graded E in colour, and has a clarity grade of VVS1. The diamond's GIA grading report number is 2193595811, which will detail further its specifications and measurements, and will also come with the purchase of the stone. AUD 1,208 Excl. Duties / Taxes. This Princess diamond is 0.31 carat in weight, and comes with Good polish and Very Good symmetry, as verified from an independent gemological laboratory. The diamond is graded F in colour, and has a clarity grade of VVS1. The diamond's GIA grading report number is 2151964907, which will detail further its specifications and measurements, and will also come with the purchase of the stone. This Princess diamond is 1.01 carat in weight, and comes with Excellent polish and Very Good symmetry, as verified from an independent gemological laboratory. The diamond is graded G in colour, and has a clarity grade of VVS1. The diamond's GIA grading report number is 2146741755, which will detail further its specifications and measurements, and will also come with the purchase of the stone. AUD 1,650 Excl. Duties / Taxes. This Princess diamond is 0.41 carat in weight, and comes with Excellent polish and Excellent symmetry, as verified from an independent gemological laboratory. The diamond is graded E in colour, and has a clarity grade of VVS1. The diamond's GIA grading report number is 6193430897, which will detail further its specifications and measurements, and will also come with the purchase of the stone. AUD 12,791 Excl. Duties / Taxes. This Princess diamond is 1.3 carat in weight, and comes with Excellent polish and Excellent symmetry, as verified from an independent gemological laboratory. The diamond is graded F in colour, and has a clarity grade of VVS1. The diamond's GIA grading report number is 5192899050, which will detail further its specifications and measurements, and will also come with the purchase of the stone. AUD 19,626 Excl. Duties / Taxes. This Princess diamond is 1.52 carat in weight, and comes with Very Good polish and Excellent symmetry, as verified from an independent gemological laboratory. The diamond is graded E in colour, and has a clarity grade of VVS1. The diamond's GIA grading report number is 1305382843, which will detail further its specifications and measurements, and will also come with the purchase of the stone. AUD 3,517 Excl. Duties / Taxes. This Princess diamond is 0.71 carat in weight, and comes with Excellent polish and Excellent symmetry, as verified from an independent gemological laboratory. The diamond is graded F in colour, and has a clarity grade of VVS1. The diamond's GIA grading report number is 2141674576, which will detail further its specifications and measurements, and will also come with the purchase of the stone.